My blog has become 6 months old with this post. 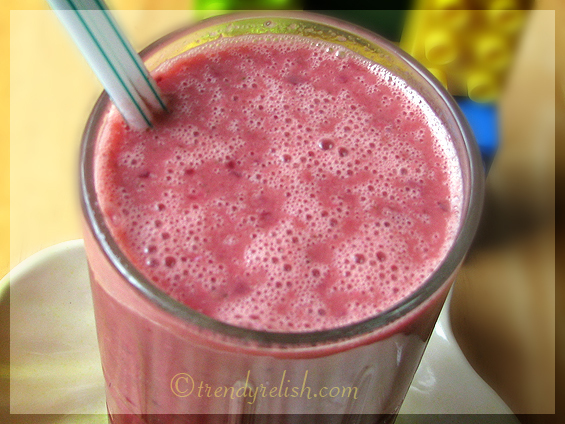 So let me celebrate it with this refreshing wholesome smoothie that is rich in nutrients. Place all the ingredients in a blender and blend into a smoothie. Enjoy it chilled. It’s as simple as that. This is a refreshing smoothie (and healthy too) for the summer. This smoothie can be served during breakfast for fresh energy. This yummy smoothie is making its way into the following events. WBB – Summer Feast: being hosted by Sia. “WBB-Weekend Breakfast Blogging” was started by Nandita from Saffron Trail. Summer Splash: being hosted by Aartee. WHF – Juices and Ice Cream: being hosted by EasyCrafts. WHF - Whats Your Favourite event series was started by Hima of Snackorama blog. Great did i know you from 6 months? Look like yest, very berry smoothie is my favo! Great entry! Wish many more happy blogging! What a pretty smoothie and congrats on your half-anniversary. 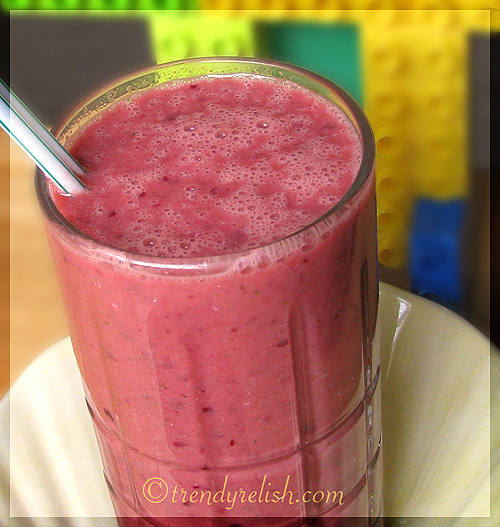 Smoothie looks great and wish you a longer and fulfilling blogging !! Congrst on the 6th month! Congrats on your successful blogging. As others said your blog is bit matured and look older for its age. Good luck for your future endeavor. Yep! Celebrate this occasion with that smoothie. nice combo of fruits..looks yum. this looks perfect. Never tried straberry shake. good one. Congrats Uma for ur 6 th month blog...Wish to see more more from you..Love the color of the smoohtie..
congrats on the milestone, Uma! Refreshing smoothie, love td color. Yummmmmm entry!!! Congratulations Uma on completing 6th month. Smoothie looks very delicious. I love any kind of smoothie. do you have an assistant to pit the cherries? could you depute that person to my home for a day? 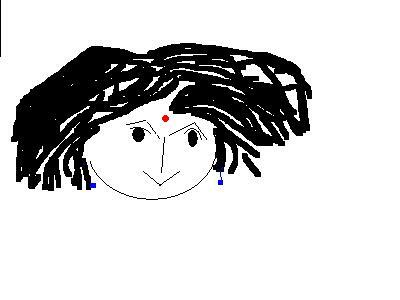 Congrats on the six month landmark of blogging, feels like you've been blogging for years sharing your splendid recipes. Love the smoothis, not sure how cherries would taste when added to this. Congrats on your blog's 6-month anniversary! Your celebration smoothie I know I would enjoy! Thanks for stopping by my blog. Looking forward to seeing you around. a biggg kiss and stay the same forever dear! Only 6 months, looks like you have been here around for a long time. Keep up the good work. Waiting to see more from you. Congrats on the landmark reached. Congratulations on completing 6 months of blogging. & posting all the wonderful recipes. Loved this smoothie . Wow, what a refreshing drink for summer! Looks delicious, Uma! I do have strawberries in my fridge.. and this is a great idea to use them! thanks for the recipe, uma! Sorry about the long absence! Home net situation is improving but the heavy rains here are causing lot of server related problems! smoothie looks so refreshing and cool..
congrats on this milestone ..
Looks so very delicious and refreshing, Uma. Lovely color. u got your 50th comment from me :) you are an expert in smoothies i guess. awesome.. looks so good. i can have these even during winter. the color of the smoothie is very inviting. and hey, thanks a lot for those awards!! I am very glad.